We have uncovered some health advice regarding red meat, courtesy of cancer experts in California. If you take a steak, for instance, and pan fry it at high temperatures, you may be increasing your risk of advanced prostate cancer by 40%. If you eat the steak, of course. 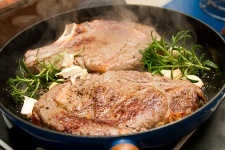 It’s another negative health breakthrough for red meat, which health experts have long suggested we eat in moderation. Older studies have shown a subtle link between eating lots of red meat and your prostate cancer risk. But what of cooking methods? Past studies have identified a cancer risk as a result of cooking meats at high temperatures. In the new study, data from about 2,000 men was looked at, with people filling out a questionnaire about how much poultry and red meat they ate. Color photographs illustrated how “done” the meat was, and was combined with information on how it was cooked. The takeaway fact: men eating over 1.5 weekly servings of red meat, fried on a pan, face an average elevation in advanced prostate cancer risk of 30%. That risk rose to 40% when men ate over 2.5 servings every week. Back to the steak for a moment — in fact, hamburger had a far higher link than other forms of red meat, which doesn’t bode well for a nation obsessed with the burger. The researchers said in a press release that there are different levels of carcinogens in hamburger, and they can get to higher temperatures more quickly than steak can. How about baked poultry? For this, researchers identified a lower risk for advanced prostate cancer. But if you switch to pan-fried chicken, the risk goes up. In the study, pan frying any meat led to a higher prostate cancer risk, suggesting that it is the most dangerous method of cooking. Where is this risk coming from? Researchers believe it is the HCAs (heterocyclic amines) that are formed during the cooking process. HCAs are carcinogens that can damage your DNA — the precise sequence of events that can trigger a tumor. HCAs are formed when sugars and amino acids are cooked at a high heat for a long time. There are other carcinogens, too, like PAHs (polycyclic aromatic hydrocarbons), which can come about when meat is grilled or smoked. If a barbecue’s fire catches a drip from the meat, the smoke that rises back up can leave PAHs on your burger or spare rib. Heavy evidence also exists for a link between HCAs and PAHs and cancer risk. It’s all about understanding cancer risk. If you eat meat, consider alternative cooking methods to pan frying. And for the best approach, cut down your weekly exposure to meat.